Like other businesses, the packaging industry evolves alongside technology. As improved materials and processes continually shape best practices within the industry, the progress makes new things possible. Digital technology, for example, continues to open doors for packagers and packaging standards. In much the same way digital advances have changed how consumers digest music, images, and literature; digital processes have also come to influence other industries – packaging among them. The following examples illustrate the relationships between consumer demand and technology, showing how tech advances and social phenomena drive packaging innovation. Packagers share common objectives, which include conveying the ideals of producers and appealing to consumers. It is already a tall order, but once logistics, regulation compliance, and continually shifting consumer demands are considered, the job becomes even more difficult. Advancing technology helps producers and packagers keep pace with consumer mandates and regulatory oversight. The evolution of food packaging provides an interesting case study in the way technology shapes standards. Consumer safety, shelf-life, and food quality are strong drivers in the food packaging industry, leading to technological advances that address these concerns. As a result, technology has focused on barrier development and functional additives during recent years. Barriers that control moisture migration and microbe development, for example, enable producers and packagers to safely bring a greater variety of food products to market. 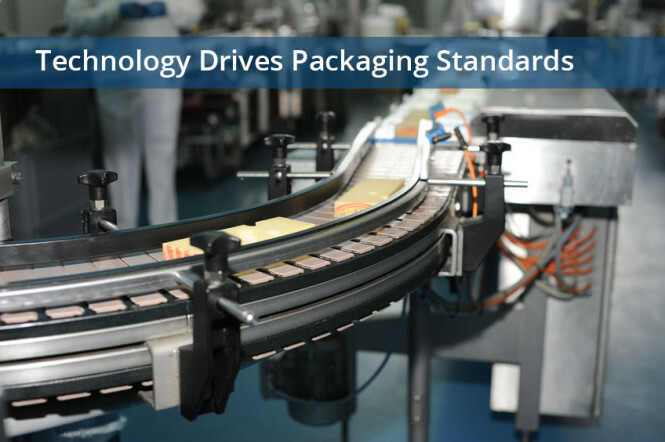 In addition to safety, technology also enables food packagers to maintain appealing aesthetics, without leaning on preservatives to keep products looking and tasting fresh. Advanced oxygen scavengers and barrier coatings serve the modern consumer market, which demands high flavor and aroma standards alongside healthy food options. In fact, consumers’ shifts toward healthier food choices have led to direct packaging innovation. Foods containing healthy fats are more susceptible to oxidation than those made with unhealthy fats, for instance, so new technology is required to reduce exposure. Improved processing methods, active packaging, and barrier advances make it possible to package these goods without compromising integrity. Consumers buy products from companies they identify with. So as retail markets become increasingly sensitive to environmental concerns, the packaging industry follows suit. Technological advances enable packagers to increase accountability using processes and materials that have limited impacts on the environment. As a result, the use of ecologically conscious packaging is expected to continue its expansion across retail markets. Bioplastics, for example, reflect industrial standards for responsible behavior, but they also touch on consumers’ social imperatives – an important driver in the packaging business. The naturally derived materials go one step further than traditional recyclable or biodegradable plastics used in the past, “speaking” directly to green-minded shoppers and global environmental concerns. Printed features like text, graphics and logos are integral parts of effective packaging. As a result, the package printing business has grown to become a substantial stand-alone industry. The rapid growth in package and label printing is expected to continue, as well. Some analysts see the $6-7 billion dollar industry growing to more than $14 billion in annual revenues by 2018. Package printing is typically accomplished using one of three methods: flexography, offset, or digital. Even the two established printing modes, flexo and offset, have evolved technologically over time. But the relatively new digital solutions are poised for explosive growth as tech advances lead to digital printing breakthroughs. Flexibility – Changing marketing strategies has traditionally been a drawn-out process, requiring producers to work through existing inventories before making changes to package designs. Using small digital printing runs, manufacturers are able to adjust on-the-fly, tailoring campaigns more precisely than was once conceivable. Personalization – Digital printing presents opportunities to customize packaging. And since modern marketing relies on personal connections with consumers, more and more producers are adopting an individualized approach. Digital printing methods provide the perfect tools for bringing the personalization trend to the packaging industry. Pharmaceutical packaging, in particular, benefits from personalization, which can be used to ensure compliance and help patients monitor doses. Last Stage Customization – Bringing certain products to market requires packagers to stage multiple versions of the same items. Globally, for example, different languages may be required to cover a particular product’s distribution needs. Using digital printing solutions, contract packagers are able to efficiently dial-in last stage needs, printing country-specific information and other variances on-demand. As producers and packagers continue to embrace new printing possibilities made available by digital printing technology, there is every reason to think they are just beginning to scratch the surface. As digital methods become more cost-effective and facilitate larger production runs, use of the technology is expected to proliferate. The packaging industry responds to technology in much the same way other businesses do. By integrating state of the art techniques and materials, packagers continue to push the envelope on consumer presentations. Digital printing advances, in particular, furnish game-changing capabilities for producers and packagers, who are embracing digital solutions in increasing numbers.